Over the past year, I’ve been experimenting with several new techniques related to beer brewing. These include full-volume boils, temperature-controlled fermentation, and all-grain brewing. For my upcoming batch, a pumpkin ale, I decided to try my hand at making a yeast starter. This will allow me to use a wider variety of yeasts and also prepare for the eventuality of making lagers (which seem to pretty much require a starter). The equipment is fairly simple: a 2-liter Erlenmeyer flask (pictured at left) and some aluminum foil. The procedure itself is fairly simple, too. I boiled 172 g (~6 oz.) of extra light dry malt extract in 1.5 L of water for 10 minutes, to produce an unhopped wort with a gravity of ~1.040. I decanted the hot wort from the saucepan into the flask, which was capped with foil and plunged into an ice bath. After about 10 minutes, the container (and presumably the wort) were cool to the touch. 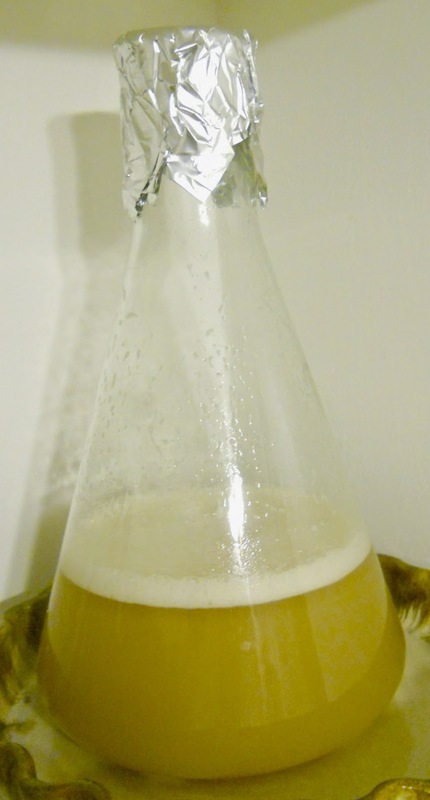 Once the wort was cooled, I pitched a tube of White Labs WLP001 (California Ale) yeast into the flask, shook it up, covered with sanitized foil, and set the flask in a relatively safe and warm corner. For this batch, I’m agitating (i.e., swirling) the mixture whenever I happen to be by the area, so roughly ever 30 to 60 minutes. If I have the time before my next brewing session (which probably won’t be until late November or early December), I may build a stir plate. This entry was posted in equipment, yeast. Bookmark the permalink.